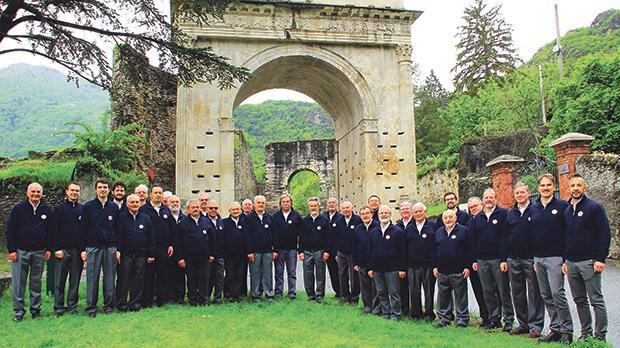 The Alpi Cozie Valsusa choir from Piedmont, Italy, will perform at the Italian Cultural Institute, Valletta tomorrow at 6.30pm, as part of the Scatola Magica series of monthly events. The 32-member choir in Malta, directed by Mariano Martina, was formed between 2017 and 2018, through the merger of two choral ensembles that had been active since the 1960s. It will present several pieces as part of an introduction to the music, traditions, history as well as food and wine from the Valle di Susa, or Valsusa, as it is pronounced in the local language, Piedmontese. This beautiful alpine valley takes its name from the ancient city of Susa, located in the western part of Piedmont, surrounded by the Cozie Alps. La Valle is 80 kilometres long and, with over 90,000 inhabitants, is the largest and most populated in Piedmont. It includes villages, castles and abbeys in the Lower Valley, among them the famous Sacra di San Michele, a symbolic monument of Piedmont, which has even inspired Umberto Eco for Il nome della Rosa. The Alta Valle includes important ski centres between mountains and forests. A glass of wine and local delicacies provided by Alpi Cozie Valsusa Choir will conclude the evening. The performance by the Alpi Cozie Valsusa Choir will be held at the Italian Cultural Institute, Valletta tomorrow at 6.30pm. Admission is free.